Spacious and elegant 3 BR 2.5 BA at one of Marathon, Florida Keys most prestigious resorts, "Indigo Reef Marina Resort the Florida Keys"
Magnificent views from this home. 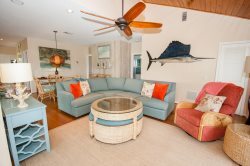 This fabulous Marathon Florida Keys Vacation Rental Resort Home at Indigo Reef is spectacular. The views of the tranquil Gulf of Mexico are amazing from both the upper and lower level deck. Step out of your Master Suite and step into Paradise on your upper-level private deck which features magnificent views of the Florida Keys Sunset. Indigo Reef Homes are laid out with a divine deck, a fully equipped kitchen, and a living & dining room plus guest bath on the first level. On the second level, the Master Suite has a private Master Bathroom and the bedroom opens to its own private balcony. There are two more bedrooms on the second level plus an additional guest bathroom for convenience and a Washer and Dryer. In all the Florida Keys, Indigo Reef stands out as one of the most tasteful resorts that we have to offer. Indigo Reef Resort features an amazing landscape characterized by native flora surrounding the entire complex which is laid out with the specific goal of 'Tropical Relaxation' in mind. The interior of this home is equally exquisite with space and luxury in focus. Indigo Reef Florida, Keys is where you want to be if you are looking for a non-single-family home environment with all of the glamorous amenities of a first class resort. Docking - 31 feet of docking immediately adjacent to unit. We can arrange Boat Trailer parking for you and guide you to the best boat ramp for your needs. YOU MAY NOT ENTER RESORT GROUNDS WITH TRAILER. Please plan your trailer parking in advance. Bedrooms/Accommodates (3/6) - The master suite features a king mattress and the other two bedrooms feature a queen mattress and two twins respectively. This home will sleep six people comfortably. Bathrooms (2.5) - There are 2 1/2 bathrooms in total with guest baths on both the upper and lower levels as well as a private bath for the Master Suite. Beaches Nearby - Sombrero Beach Marathon is a ten-minute drive from the Resort and Coco Plum Beach is only five minutes away. Arrived on a very warm day to a very beautiful and cool home. Words can't express how this gem of a place is. Even the pictures you will see online will not fill your eyes like the way it does when you step out the back door to an awesome view. The home was full, I mean fully furnished as if it is your own home. The only thing the house doesn't come with is a full-time butler lol. My family and I had a very comfortable time here and will always recommend Indigo Reef to everyone we know and don't know. I was super sad we had to leave after a fast week, but we will be back next year. Thank you Coco Plum Staff for making our stay enjoyable. Thank you for an amazing holiday at Indigo Reef Sunset House. The home was exceptionally clean and comfortable. We enjoyed the starter items Coco Plum left behind and the exercise room was a smash with the teens. Also, walked to local restaurants for dinner. The townhome was beautifully decorated with everything we needed, very upscale cottage style furniture, great mattresses, spotless bathrooms. Amazing sunsets right from our porch. The pool was nice and well maintained. The boat slip was right in front of our townhouse and very convenient. The location in the Keys was central to everything, great restaurants, close to attractions and shopping. Indigo Reef is located on the Gulf but the Vaca Cut is nearby and leads right to the Atlantic where there are great reefs for snorkeling and diving. We plan on another visit soon! An awesome place to stay with your family. Gorgeous home with enough space for 8-10 people. We only had 3 and it was incredible. The daily view from either the lower level deck or the upper-level balcony is amazing throughout the day. It never gets old. The home was immaculate and we had ZERO issues. Check-in was more than simple, by far the easiest check-in ever. Words will never tell you how great Indigo Reef is, so choose this place if you want to thoroughly enjoy a family vacation. Thank you Coco Plum Vacation Rentals, you guys are top notch. Room Tip: Choose Sunset House as its very modern and super close to the pool. This was the easiest rental experience I've ever had. It didn't matter how late we checked in nor did we have to go to a desk to do it. Your home comes with a carport which is located near the unit and it is numbered. You may use this carport only for your primary vehicle. Additional cars may be parked in either of the overflow parking lots located to the left and right of the main drive as you enter the resort.